The World Carrot Museum has the honour of having an article published in the renowned academic journal Chronica Horticulturae. Co-authored with Jules Janick the James Troop Distinguished Professor in Horticulture, Department of Horticulture & Landscape Architecture, Purdue University. The item is called Carrot History and Iconography a fascinating journey through the Carrot's development from Wild to Orange and beyond. Full copy here (page 13 onwards). Extract here. The Carrot is an economically important horticultural crop that has gained popularity since world War Two (ended 1945) due to increased awareness of its nutritional value. 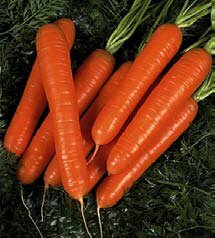 Orange carrots are highly revered as “good for the eyes” due to their high content of hydrocarbon carotenoids, a class of phytochemicals that are often precursors to vitamin A. α- and β-Carotene predominate in orange carrots. Types of Carrots - there are two distinct categories of carrot in the modern world, the Cultivated Carrot (domesticated), which is detailed below, and the Wild Carrot which now has its own page. Click here to go there.. Note - Some classifications show Umbelliferae rather than Apiaceae. The cultivated carrot is the second most popular vegetable in the world after the potato. When you read the nutrition pages you will see and agree why it should be number one. The health benefits of carrots are well established and cover a wide range in human health conditions. 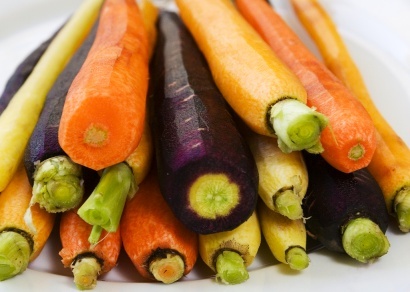 In general, carrots are important for healthy eyes, skin, hair, growth, and immune systems. They can lower cholesterol, prevent heart attacks, and help reduce the risk of certain types of cancers. Carrots are packed with nutrientsIn fact in England the carrot is Number One according to a survey carried out by the National Trust in 2002. Overall, 17% of the 2, 031 people in the survey opted for the carrot. It came ahead of the potato (15%) and broccoli (13%) in a battle of the vegetable patch. Least favourites by those questioned were Brussels Sprouts, Parsnip, Swede and Turnip. Although, there are many different carrot varieties available, British farmers tend to grow the Nairobi variety, a berlicum-nantes cross, which is reliable, damage resistant and produces a good yield. The carrot plant is cultivated across the world for its prized taproot. The plant is biennial and bears flowers during the second year of its life. However, in general, the whole plant is harvested prematurely when the root reaches about an inch in diameter, tender and juicy. 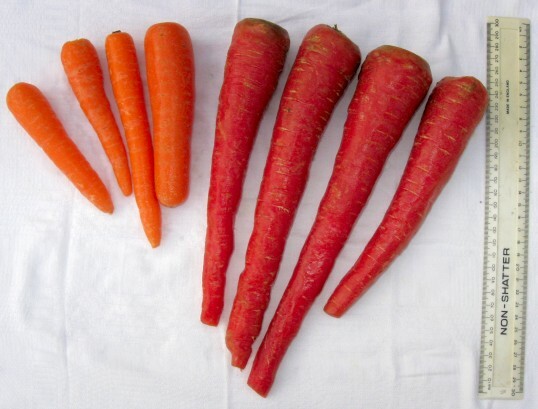 Carrots vary widely in colour and shape depending on the cultivar types. The colours are shown in the photo below and shapes and typologies lower down, with more detail on a separate page in the museum here. Daucus is a worldwide genus of herbaceous plants of the family Apiaceae of which the best-known species is the cultivated carrot. The Daucus genus of Umbelliferae Apiaceae, has about 25 species. 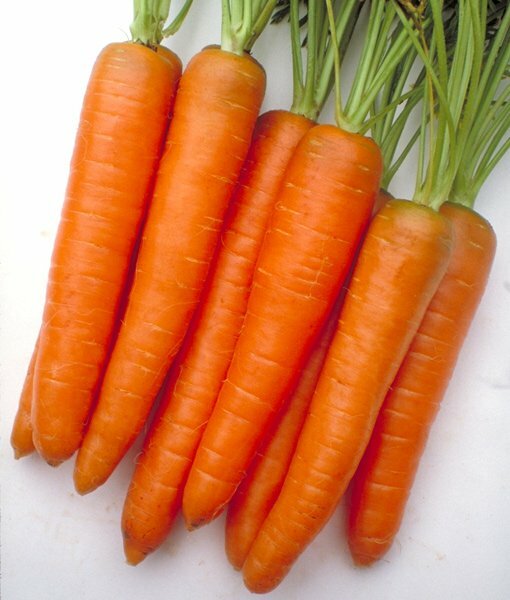 Approximately 175 carrot cultivars of carrot were commercially available in 2013, in the USA. The cultivated carrot, hybridised from the wild carrot, can be either an annual (mainly in tropical areas) or a biennial (mainly in temperate areas). It is an erect herb of 20-50 cm tall when mature, and 120-150 cm when flowering. The taproot is fleshy, straight, conical to cylindrical, 5-50 cm long and 2-5 cm in diameter at the top, and usually orange (other colours include: purple, yellow, or white). Daucus Carota is a complex species, botanically comprising both wild and cultivated carrots. All information within these pages refers to Daucus carota sativus, some of the varieties of which are described below. Other members of the carrot family include: Chervil, Celery. Celeriac, Arracacha, Fennel, Parsnip and Parsley. 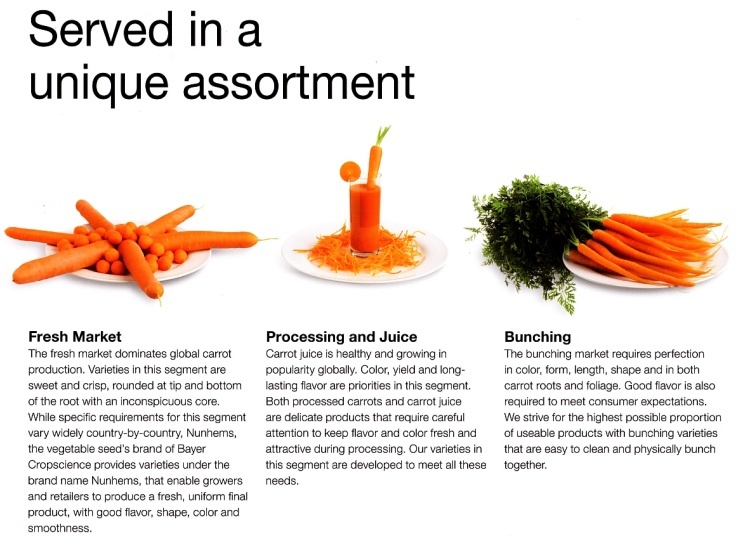 The majority of large commercial carrot growers process their produce in similar fashion. On arrival at the plant the trucks off load their delivery into a washing machine which gives the carrots an initial wash and conveys the carrots on their processing journey and separates the soil into a container ready to be put back on the land. Any remaining stones are also separated and even these can be used to mend the farm roads! The carrots are given a more thorough wash and polish before being run over a grader to help sort size and shape and irregularity. Market Carrots are then manually (or computer) graded on a conveyor belt before being hydro cooled and packed into bags and boxes ready for market. The carrots are often now sold in boxes as many wholesalers prefer these for ease of stacking and handling. Other carrots go off to an automated weighing and bagging area, to satisfy the needs of the stores. Packing is carried out in various ways according to the market needs. Trays, bags, small cases of different capacities are used; either standard or provided by the customer himself. The finished product is always really fresh, worked, packaged and shipped daily (without taking from the stock), identified by production batch and harvest date. The largest carrots tend to be sold to the food processing trade to be made into soup, baby foods etc, and of course cfor juicing. Odd shaped or split carrots are often netted up for pony feed. Some of the waste is sold in bulk as animal fodder. Carrot Genome Web Sequenced - May 2016 - An international team has sequenced and begun an analysis of the genome of the carrot, Daucus carota. 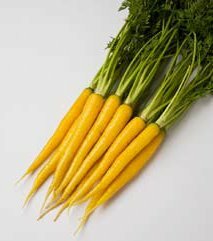 The new, high-quality genome assembly, which the researchers established for an orange doubled-haploid carrot, contains more than 32,000 predicted protein-coding genes. 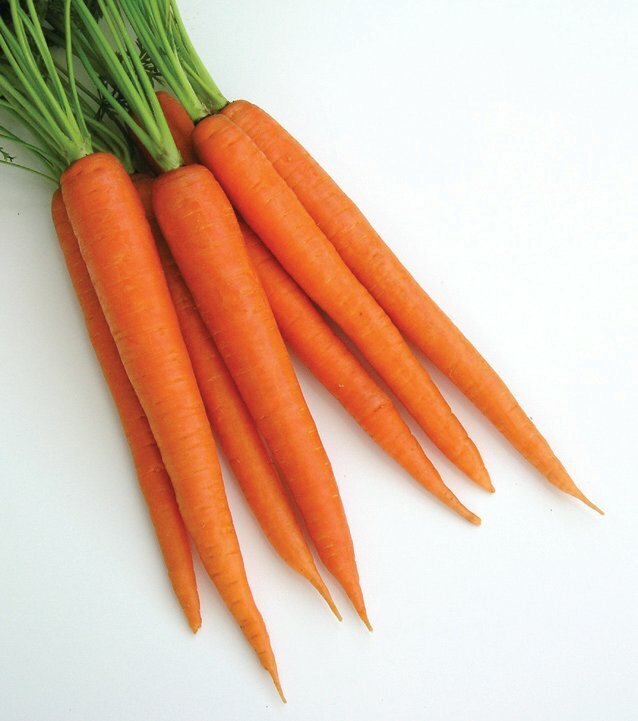 As the researchers reported today in Nature Genetics, they were able to track down a candidate gene involved in orange carrot pigmentation and gained insight into the evolution of plants in the euasterid II lineage, which contains carrots, lettuce, sunflower, celery, and parsley. Carrots are specifically grown for particular market segments. 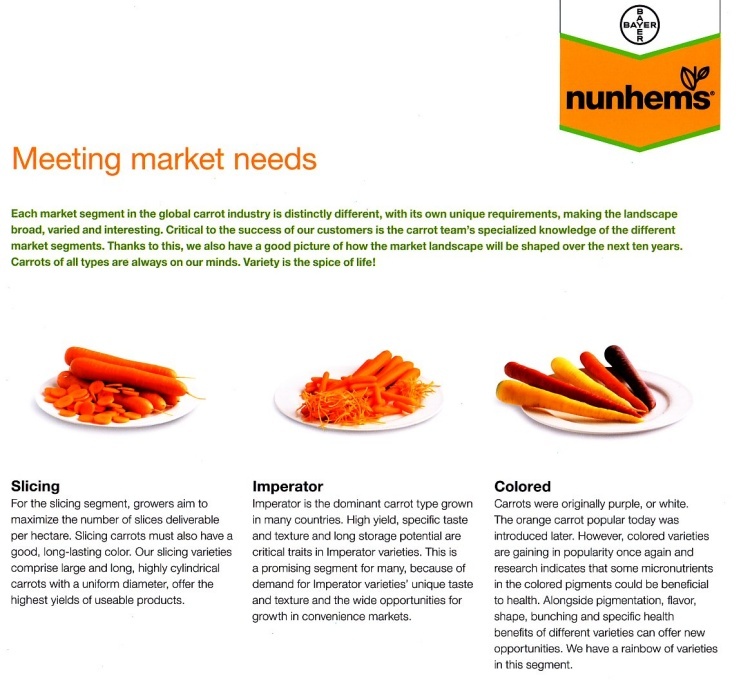 Nunhems, a world leading seed supply company, has a passion for carrots and has kindly produced this summary of how they use their vast knowledge of carrots to ensure customers demands are catered for. Visit Nunhems here. Breeders aim to derive cultivars with early maturation, high yield, high beta-carotene content; the ability to set seeds under poor conditions; uniform root size, shape and colour; small tops, tender roots; improved flavour, texture, sugar content and dry matter; resistance to cracking and breaking during harvest, roots that taper uniformly, slowness to bolt; tolerance of poor soil and climate; wide adaptability; resistance to disease, especially leaf blight, black rot, powdery mildew, bacterial soft rot, and and to pests including caterpillars and carrot fly. Read about the British Carrot Growers Association trade field trials here. Every year the British Carrot Association organise the Variety Demonstration and Exhibition - a trade event to show off the latest varieties and yields in the way of field trials. Most growers and seed producers pay a visit to learn about developments and and see fro themselves to end product pulled direct from the field trial sites. This gives an indication of potential yield, flavour and colour for next years crop planting. Read about the varieties held in the UK Heritage Seed database. Carrots are also used extensively in the food co louring industry for which the orange (and also the black) carrot is one of the 20+ raw materials used by GNT. The main colour made out of carrot is red and orange. However these are usually mixed these raw materials together with others to make all kind of variations to this colour. GNT is the global market leader in Colouring Foods and a trusted partner to the food and beverage industry. They provide vibrant colour shades with their EXBERRY® Colouring Foods, which can be used in a wide range of applications including beverages, confectionery and dairy products, to name just a few. The possibilities are almost limitless. Nutrifood® products, providing the concentrated goodness from fruit and vegetables, can be used to enhance product characteristics such as taste, appearance and nutritional value in many applications. As developer of colouring foods, used in the food industry by major manufacturers, they deliver 7 out of 10 major manufacturers worldwide in 70 countries. They are proud to help the industry to deliver clean labels as they do not use any chemicals in the production process. 1. 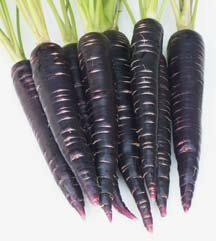 Eastern/Asiatic carrots - These are often called anthocyanin carrots because of their purple roots, although some have yellow roots. They have pubescent leaves giving them a grey-green colour and bolt easily. They have slightly dissected leaves, with branched roots and are an annual plant. The greatest diversity of these carrots is found in Afghanistan, Russia, Iran and India. These are the possible centres of domestication which took place around the 10th century. These types of carrot are still under cultivation in Asia, but are being rapidly replaced by orange rooted Western varieties. 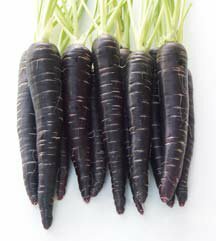 (Purple carrots are making a comeback click here for details). 2. 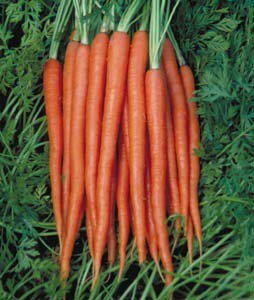 Western or Carotene Carrots - These have orange, red or white roots. 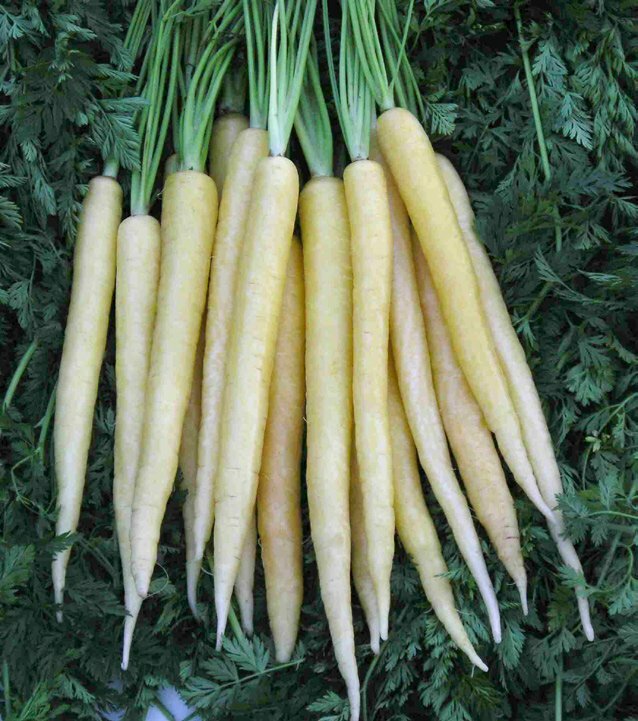 It is most likely these carrots derived from the first group by selection among hybrid progenies of yellow Eastern carrots, white carrots and wild subspecies grown in the Mediterranean. the first two originated by mutation. These have strongly dissected leaves, the roots are un-branched and they have a bright green, sparsely hairy foliage and are biennial. These carrots may have originated in Turkey. 1. Short-rooted varieties: These types mature more quickly and the first to be sown. e.g. : Amsterdam Forcing, Tiana, Early French Frame, Early Nantes, Champion Scarlet Horn. 2. 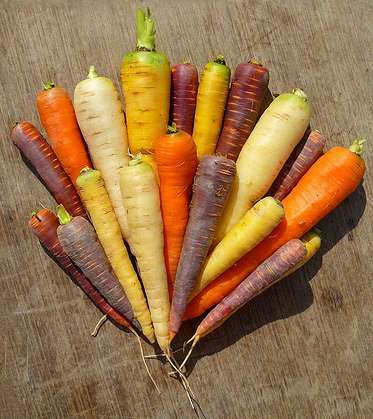 Medium-rooted varieties: The most common type of commercially grown carrots. e.g. : Mokum; Flakkee; Autumn King; Chantenay Red Cored; Royal Chantenay. 3. 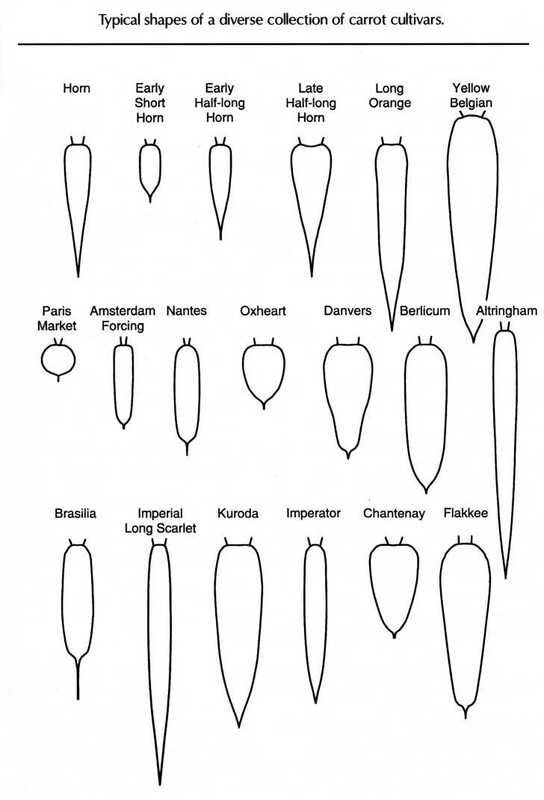 Long-rooted varieties: These are usually grown in well-prepared and deep soils: e.g. : New Red Intermediate, Saint Valery. 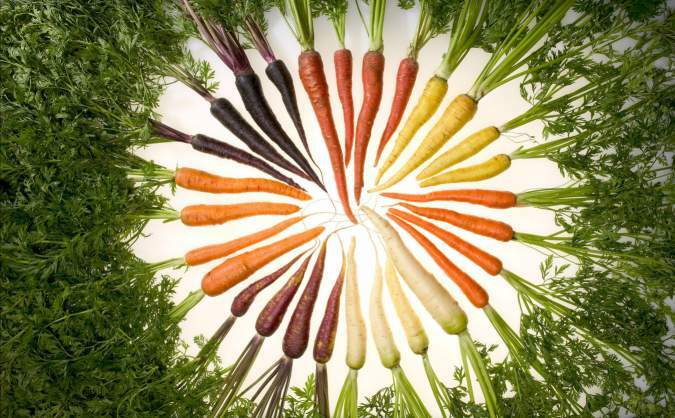 Photo compliments of USDA Agricultural Research Service, where researchers have selectively bred carrots with pigments that reflect almost all colours of the rainbow. More importantly, though, they're very good for your health. Photo by Stephen Ausmus. Details of common varieties with links to photos are now on a separate page - click here. Many types of carrots are available, varying according to the area and climate, and every year new varieties are brought out on the market by the multi-national seed companies. These companies try to find the perfect carrot for every market and climate. Golf ball-type carrots (Thumbelina) and the slightly longer Chantenays are good for containers and heavy soils. Short carrots also mature faster, shaving two weeks off the time it takes to put them on the table. 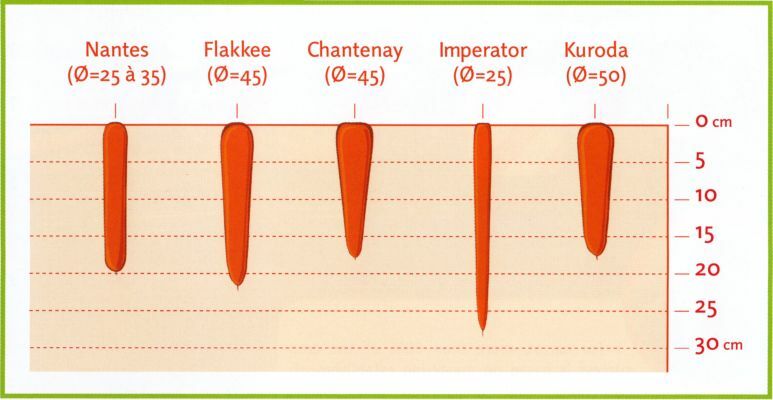 Nantes, Imperator and Danvers (and Danvers Half Long) grow up to 7 inches long and are suitable for most other soils. If colour is an issue, Danvers Half Long and Royal Chantenay are bright orange, while Scarlet Nantes and Blaze (an Imperator) are deep orange, almost red. Believe it or not - There is a carrot variety for every letter of the alphabet and just to prove it click here to see the full list. The maroon Carrot has been re-discovered by Dr L Pike from Texas. Check out the full story here. Thin, 9-12 inch roots have exceptionally fine flavour. A baby gourmet carrot that is tender and sweet. A Nantes-type carrot that was developed in France for canning and pickling. Almost coreless cylindrical carrot with a brilliant orange colour even through the soft core. The best tasting carrot. It is a versatile, good winter keeper, in the cellar or the ground, that is tasty raw or cooked. Vilmorin's 1856 edition of The Vegetable Garden refers to this French heirloom as, "A large handsome variety, with great productiveness, and at the same time a fine, regular shape, and thick, sweet, tender flesh." See more photos of common varieties supplied by Thompson and Morgan the leading seed suppliers in the US and UK. Click here. Huntapac - John also took a personal guided tour of Huntapac one of the leading carrot packers in England and suppliers to the major supermarkets in the UK. Poskitts, one of the leading supermarket suppliers. Hobsons, growing carrots for the food processing industry. 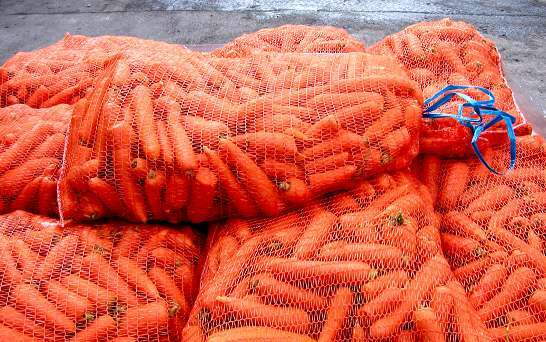 Cooks carrots in Lancashire supply many wholesale market, processing plants and local shops with their top quality produce - . Another well respected carrot grower in Britain is P Caunce & Son at Brow Farm. at Brow Farm (yet to be visited!). Potts Master Bakers - John had the privilege of having a personal guided tour of the leading baker of organic carrot cake, supplied to major supermarkets in the UK. It is, naturally, based in Yorkshire! Not only does it supply the trade, but also larger shops, restaurants and hotels. Quite an operation! Tio (This is organics) Ltd is one of the leading organic food producers and suppliers in the UK and one of the largest growers of organic carrots in the UK and Europe. Organic carrots are their core product which are supplied year round. For approximately 10 months of the year carrots are grown in Scotland. A farming method pioneered by this company is affectionately known as the NUTS (Non-Umbelliferous Targeting Sabre) machine (shown right). Every season an 80 strong workforce helps to hand weed our organic carrot fields. Literally lying down on the job and facing the field, the tractors pull these specially designed trailers slowly along the field beds, giving the workers adequate time to pick all the weeds. 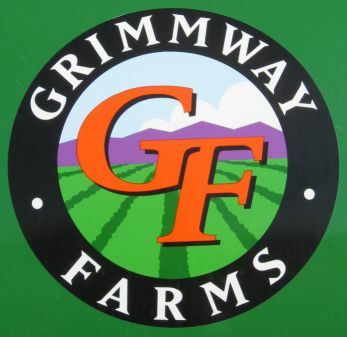 Grimmway Farms is dedicated to providing good value, consistent quality and dependable service to fulfill customers’ needs - those guiding principles have enabled our company to conduct business with integrity for more than 40 years.. The story of Grimmway began in 1968, when brothers Rod and Bob Grimm set up a roadside produce stand and planted the seed that would blossom into today’s Grimmway Farms. Ten years later, the brothers moved north to Kern County, where the family business took root and prospered from their dedication to product quality and customer service. For more than 45 years, our commitment to that promise continues to be upheld as a top priority. Grimmway Farms’ dedication to consistent quality and dependable service has made them the global leader in our industry. Grimmway Farms has grown to become not only one of the largest growers, producers and shippers of carrots in the world but also a leading supplier of organic produce, potatoes and carrot juice concentrate. In 1985 Grimmways moved the carrot processing plant to Bakersfield, CA wherethe climate enables two annual carrot crops. Rooted in Quality, thanks to nearly 100 years of working the land, Bolthouse have a hard-won wisdom and passionate commitment to providing superior, fresher products. Motivated by the Greater Good Community is their top priority and are driven as much by the health of their families as they are the health of the country and the world. For that reason, they never stop learning and partnering with others who share their cause and passions. Bolthouse believe in the power of innovation to connect people with fresher food. That's why they add a punch of creativity to everything they do – from farming to product development to marketing conversation. 95 years experience of farming with creativity and innovation. The results: high-quality products made as much of fresh thinking as fresh ingredients. We are partners on a journey to change the way people think about and use fresh fruits and veggies. We will help inspire people to lead healthier, more vibrant lives. People know they should make healthier food choices, but it's not always easy. We believe everyone deserves healthy food that's more accessible, available and affordable. Bolthouse website here - The Bolthouse Q and A section is here. Events Supported by the Carrot Museum - the ONLY way to view the majority of the Carrot Collection! Countryside Days at the Yorkshire Showground. - every June gthe Museum puts on a show to teach kids about all aspects of carrots. They get to plant their own carrot seed and have the unique experience of a tour of Museum exhibits. 2 days+240 kids= GREAT FUN!! The Museum has now taken part in Countryside Days for the past 5 years. Springtime Live is another Yorkshire Show ground event, in the Spring (duh!) which gives families an opportunity to learn about what happens in the countryside early in the year and take part in various craft and art activities. Some photos of the Carrot Museum stand here. The Carrot Museum Road Show has had exhibitions at the Royal Horticultural Society, Harlow Carr Gardens for the past two years. Visit the dedicated pages here. Talks to schools, local societies and institutions are given on a regular basis, please e-mail the Museum if you would like a show or talk about carrots.